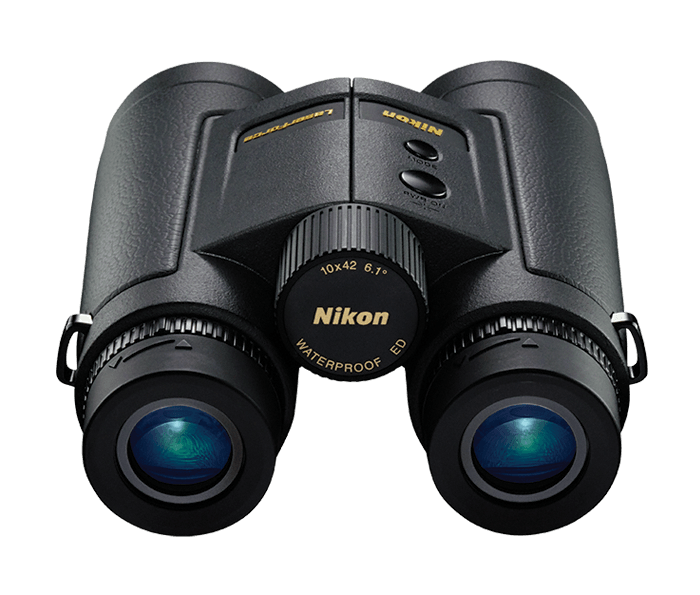 Combine Nikon binocular performance with the extreme speed and ranging technology of a 1900-yard laser rangefinder and you have LaserForce, Nikon’s new 10x42 Rangefinder Binocular. Quite simply the single optic solution for serious hunters who depend on both their binocular for picking out distant animals and their rangefinder for getting the exact distance before taking the shot. Featuring ED (Extra-low Dispersion) glass and Nikon’s ID Technology to compensate for incline or decline angles, LaserForce puts ranging precision, optical performance and rugged performance within your reach. Reflective mirror coating is applied on the mirror surface of the roof prism unit, providing bright images. Lead- and arsenic-free glass is used for all lenses and prisms. ED (Extra-low dispersion) Glass corrects chromatic aberration that causes colour fringing for high-resolution, contrast-rich images. Ensures a clear field of view, even for eyeglass wearers. Rubber Armored, Waterproof and Fogproof over rugged metal die-cast body for shock resistance and a firm, comfortable grip. Waterproof/fog-proof performance, with a nitrogen-purged body that prevents fogging or molding inside the optical system even under significant changes in temperature.